When it comes to sharing your coffee with the one you love then there’s nothing that can beat this awesomely crafted, beautiful and loveable piece of art. It shows that special bond that you have with your loved one. This completely white and “made for lovers” couples coffee mug is made of porcelain (that too of very high quality) and is the most unique mug that we’ve ever seen. 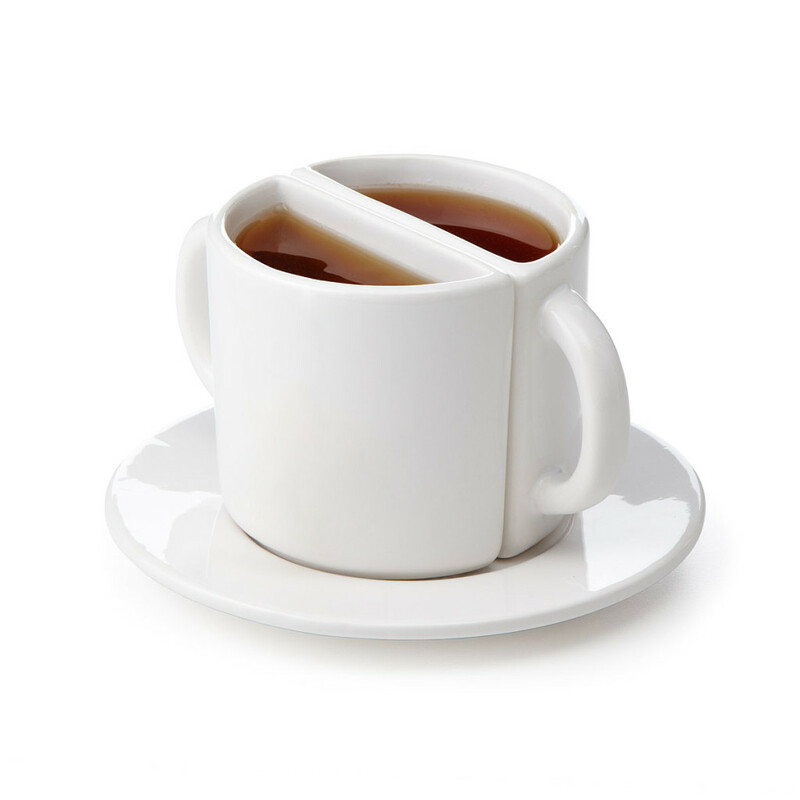 Furthermore, it comes with an equally simplistic yet elegant and flattering saucer which makes it a perfect set of coffee mugs to have in your home. Read what real buyers of this two in one coffee mug have to say about it!!! As mentioned earlier that this collectible coffee mug is made up of porcelain and has the following dimensions: 4.5″ L x 2″ W x 3.25″ H for each cup. Also the saucer has a diameter of 6.4 inches and is quite big enough to place both the cups comfortably. The best part that we liked about this uncommon coffee mug is that you don’t have to worry about washing it, just put it in the dishwasher and you’re done. Yes, they are dishwasher safe. Are They A Good Gift Idea? Well, to that question, all we have to say is a big YES!!! They’re different, uncommon and definitely eye catching. They do really make super awesome gifts. The moment we saw them, we just fell in love with these white beauties. These are the types of coffee mugs that every coffee (or even tea) lover must have in their collection.